Not having footage is the bane of a Hungarian football lover’s life. You want to see how Hungarian football was in its best periods? Take a look tactically how the great Honvéd, MTK or the Magic Magyars played? Want to witness Ferenc Puskás or Nándor Hidegkuti in their prime? You have no luck then, as there is (almost) sod all from the period. Certainly not complete matches, but even photos are hard to come by. We have to rely on newspaper reports and contemporary accounts most of the time. 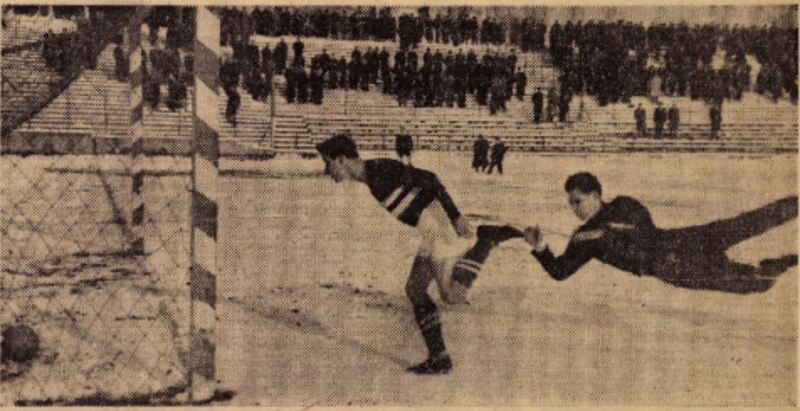 Given the above, it is not very surprising that we have no footage of perhaps the greatest and certainly maddest Hungarian league game ever, played at 11 in the morning between walls of snow on the 9th January 1955. Twenty-five thousand fans witnessed that Honvéd and Vörös Lobogó (MTK – the team temporarily lost its name and colours in the 1950s as it was first renamed to Bp. Bástya, then Bp. Vörös Lobogó – The Red Banner) went at each other at the old Üllői út ground. It’s safe to say that the two best Hungarian clubs of the 1950s – which meant they were amongst the best in the world – went all out for entertainment, as their match ended 9:7, and it’s still considered the stuff of legend. WHY THE HELL IN JANUARY? If you started following Hungarian football only recently, you know that our teams do not do anything resembling football in early January. In December, a long break starts and the spring season only starts again in late February. So why the hell did Honvéd and MTK field the Üllői út pitch on such a godforsaken date, at 11 in the morning? The answer is that they needed to, in order to complete the 1954 league season. Back then seasons stretched across the calendar year. The league kicked off in early March and it was supposed to finish by early December. 1954 was the year of the World Cup though, and Honvéd and MTK – the prominent clubs of the period – were heavily affected by the preparation for the World Cup (ending in heartbreak) and international friendlies. Both teams fielded several superstars, so it’s no coincidence they were most sought-after as friendly match partners. Thus came that in mid-November Honvéd still had 10 league games left (out of 26! ), and MTK needed to play 6. Both teams played out such a mad schedule that it can be only compared to the Christmas madness of the Premier League. Honvéd – returning from a legendary friendly against Wolverhampton Wanderers – played on 19 December, 26 December, 31 December, 5 January and 9 January, while MTK had league games on 19 December, 22 December, 26 December, 5 January, 9 January and 12 January. This was sheer madness – no wonder the squads were heavily depleted by the time the super derby came around. Honvéd were totally knackered by December and duly lost 3 matches out of 5 in that period, but still only needed a draw against Vasas Izzó (not the same club as Vasas) to clinch the title. They did that in a minimalist fashion: Sándor Kocsis scored twice and Honvéd drew 2:2 to mathematically ensure the league gold medal. Honvéd’s title win reduced the Honvéd–MTK match a dead rubber – or, more perhaps more aptly, a glorified friendly. But no-one could imagine the fireworks the two teams had in store. 9th January came with heavy snow and winter reigning: the teams were getting used to playing their games in snowy conditions. 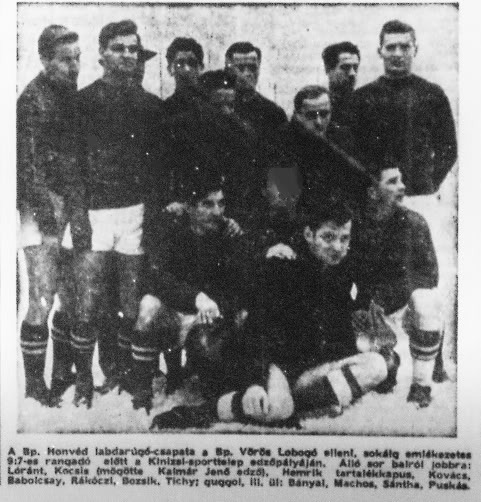 They were also getting used to playing without key players – Honvéd had Gyula Grosics (and his backup goalie, Lajos Faragó), László II Budai and Zoltán Czibor out, while MTK had first-choice goalkeeper Sándor Gellér, István IV Kovács, Péter Palotás and József Zakariás on the injury list. Grosics, Budai, Czibor, Gellér, Palotás and Zakariás were all squad members of the World Cup silver-winning Hungarian team. What was left of the teams was still formidable. Honvéd had Gyula Lóránt, József Bozsik, Sándor Kocsis, Ferenc Machos and of course Ferenc Puskás from the World Cup runner-ups, while MTK fielded Mihály Lantos, Nándor Hidegkuti, Imre Kovács and Károly Sándor from the national squad. “We try to play an entertaining game”, both coaches promised. Huge snow covered the red clay track by the field, as the two top teams ran onto the Üllői út pitch, which was more or less in okay condition. Honvéd were 1:0 up after only 3 minutes, as Lajos Tichy bundled into the net with the ball from very close range. MTK replied with three: Nándor Hidegkuti scored a free-kick after a grave goalkeeping error and Károly Sándor scored a brace, so by the 19th minute, MTK were 3:1 up. Sándor – originally a right-winger – felt that he could utilise his extreme speed and positioned himself as a centre-forward, waiting for through balls. Honvéd got one back in the 24th minute through Sándor Kocsis. The defence seemed to be unable to cope with Károly Sándor though, and the MTK winger terrorised the Honved backline until Gyula Lóránt – the enforcer and centre-back of the Magic Magyars – plain and simply kicked the forward off the field. Lóránt got away without a sending off – all match reports claimed that he made a very ugly and deliberate foul and should have been sent to the showers –, and MTK lost its biggest weapon. Lóránt got what he wanted – MTK needed to substitute Sándor, though he was subbed off as well, as fans wanted his blood for the cynical foul –, and the opposition were reeling, having lost their best player on the pitch. Between the 32nd minute and half-time all hell broke loose, as Honvéd ran riot and scored 5 (!!!) in a row against a confused MTK, turning the match around from 2:3 to 7:3. 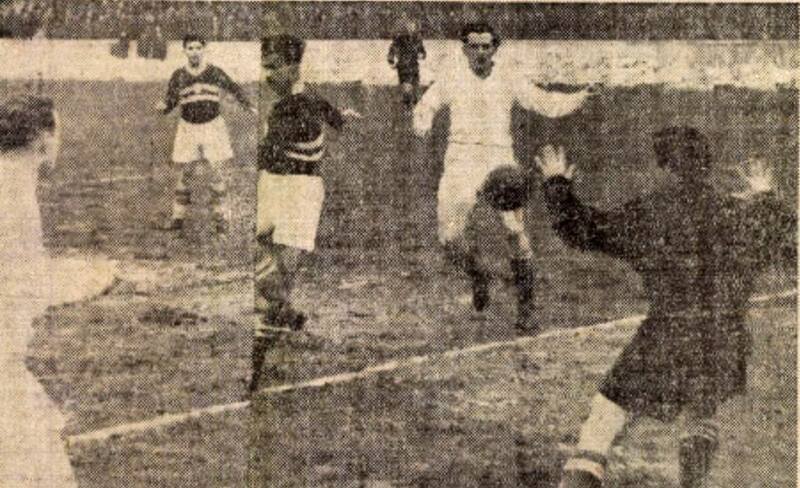 Ferenc Puskás, who already scored a hat-trick, followed up with a screamer early on in the second half, leaving the MTK keeper rooted to the spot. A quick goal here and there and it was already 9:4, but it was certainly not over. MTK had vastly superior fitness and went all-out attack, scoring three goals by the 81st minute. 9:7 and the crowd was siding with MTK, wishing for a miracle comeback – man of the match Hidegkuti missed a golden chance to make it 9:8 (and 5 goals for himself), and it stayed 9:7. It was both: backlines (and especially the three-man defence lines, consisting of heavy, slow players) were tormented by the quick forwards, who played with utmost excellence. Both teams had young backup goalkeepers – this certainly did not help when facing world class strikers! The midfielders did not provide enough shielding for the defenders – their work rate going backwards was way off, according to the reports –, but on the other hand, both teams went all for entertainment and tried to outbid the other with its spectacular attacks. Honvéd won the 1954 title with a four-point advantage over MTK (scoring 100 goals in the process), Ferencváros (then Bp. Kinizsi, forced to play in – oh, the horror – red and white) took the bronze medal. The huge divide between the Budapest teams (the Hungarian league has been traditionally highly Budapest-centric) and ‘the rest of the country’ showed, as the teams of the capital occupied 6 of the first 8 spots. Lóránt was suspended – along with Sándor! – for his brutal foul, but both players started the 1955 league season in their usual place, the starting lineup, so effectively no action was taken. Both teams were sent for a well-deserved short break. Honvéd went on to win the league in 1955 (MTK, yet again were second, Ferencváros, yet again, were third), but the 1956 league could not be finished because of the revolution. Hungarian football was never the same again. Budapest, Üllői út. Attendance: 25 000. Referee: Pósa. Honvéd: Sántha – Rákóczi, Lóránt (Palicskó), Kovács Já. – Bozsik, Bányai – Machos, Kocsis, Tichy, Puskás, Babolcsay. Coach: Kalmár.